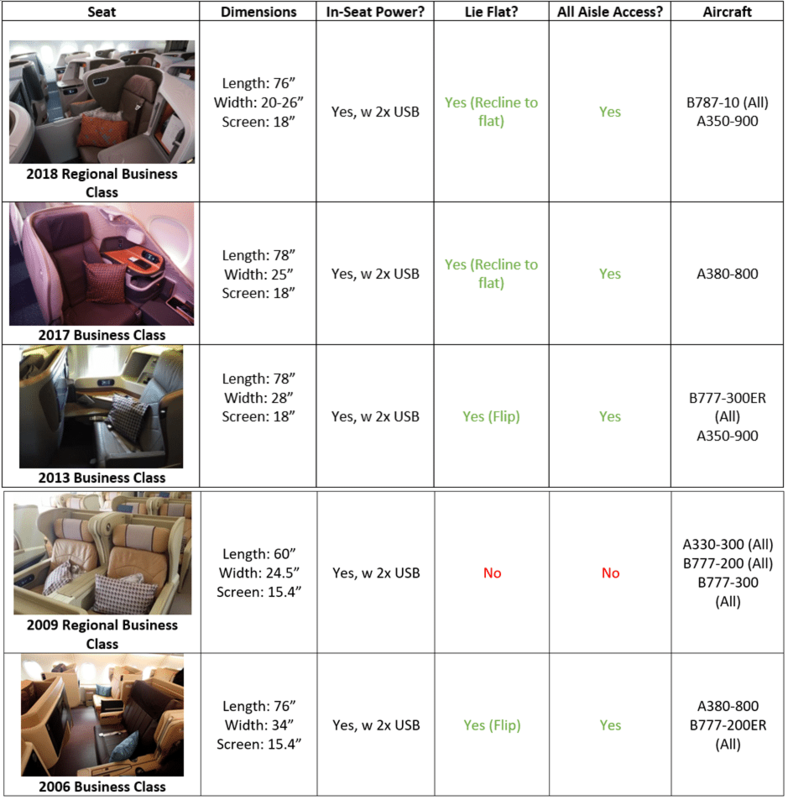 Spend your miles on the right cabin products by knowing the five different types of SQ Business Class seats. So you’ve finally accumulated the miles needed for your first-ever Business Class redemption on Singapore Airlines. Congratulations! Now there’s just the small matter of making sure you get the best possible experience, and that all starts with picking the right seat. 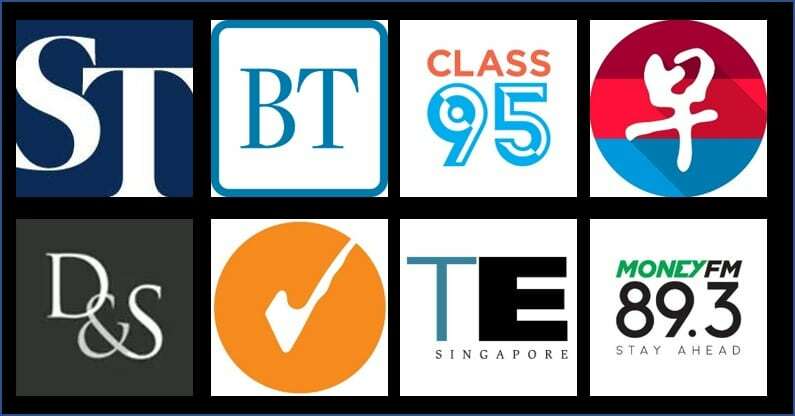 This guide will orientate you to the different types of Business Class seats available on Singapore Airlines, and how to identify which one you have. How many different Business Class seats are out there? 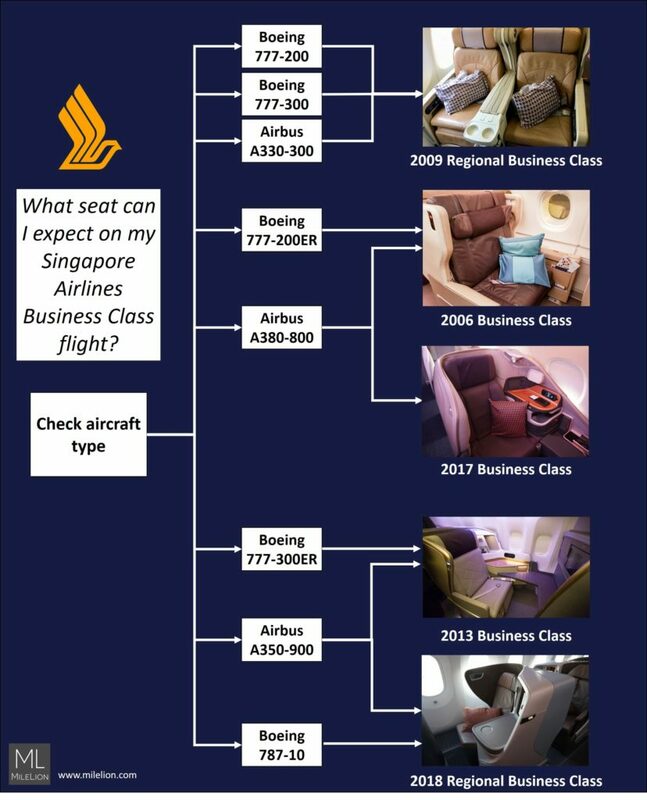 Singapore Airlines currently uses five different types of Business Class seats across their fleet. Here’s a brief summary of their key traits, and which aircraft you’ll find them on. The year in front of the seat name refers to the year the product was introduced. If you’d like more details on each individual seat, have a read of The Milelion’s Seat and Fleet Guide. The simplest way of telling what Business Class seats you can expect on your flight is to look at the aircraft type. You’ll be able to find this in your booking confirmation, or during the booking process. As you can see, in most cases simply knowing the aircraft type is sufficient to deduce what kind of seat you have. However, there are two types of aircraft where it’s slightly less clear- the A380-800, which has a mixture of the 2006 and 2017 Business Class seats, and the A350-900, which is predominantly fitted with the 2013 Business Class seat but has a handful of regionally-configured airframes with the 2018 Regional Business Class seat. Go and look at the seatmap for your aircraft, which you can check out under the Manage Booking page or during the booking process, before you make payment. 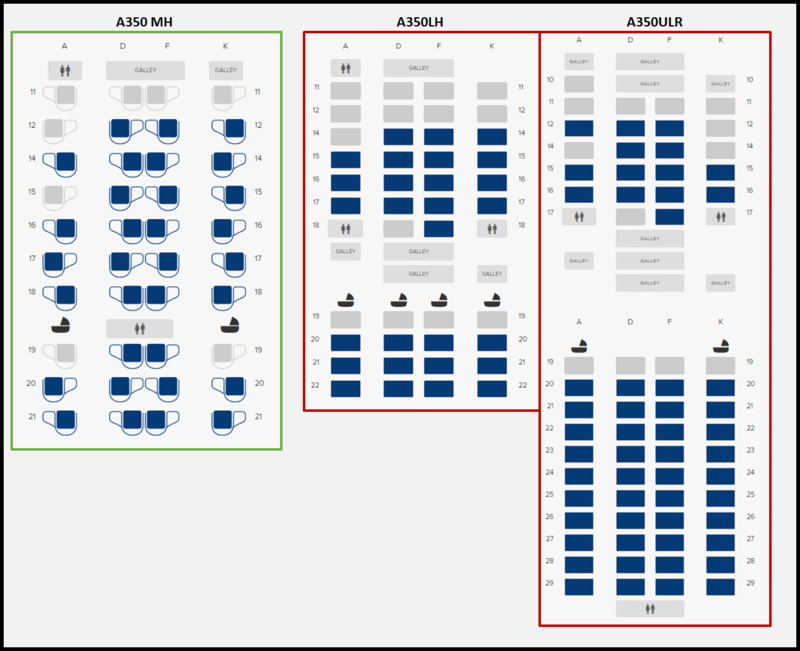 If your seatmap looks like the one on the left in green (with the double bed symbol in 11 D/F), you have the 2017 Business Class seat. If your seatmap looks like either one on the right in red, you have the 2006 Business Class seat. 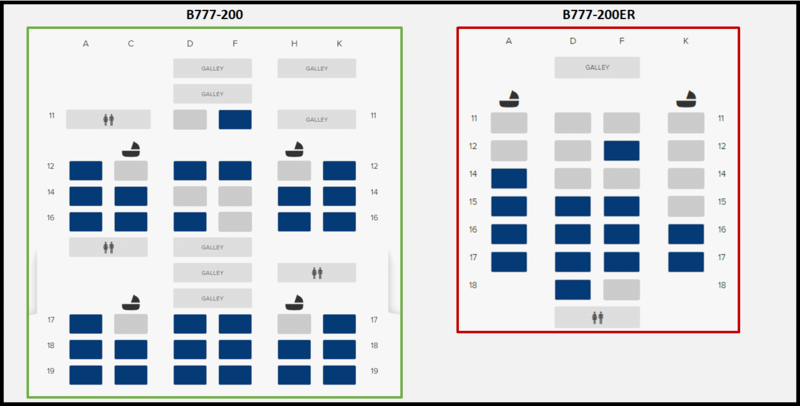 If your seatmap looks like the one on the left in green, you have the 2018 Regional Business Class on Singapore Airline’s new regional configured A350. 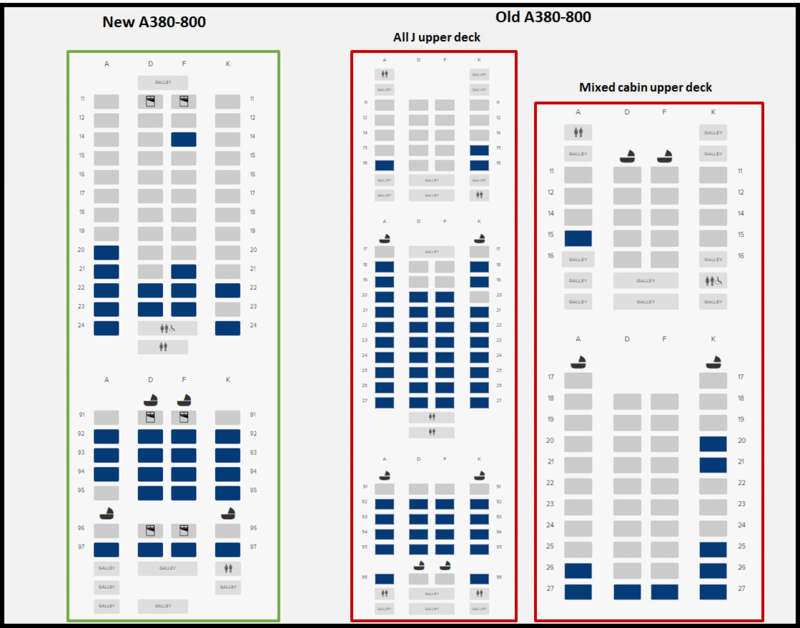 If your seatmap looks like either one on the right in red, you have the 2013 Business Class seat on either the long haul or ultra long haul configured A350. Although checking the aircraft type is generally sufficient to help you deduce which seat you have, be careful when you see “Boeing 777-200”. That’s because SQ operates two different types of aircraft: The Boeing 777-200 and Boeing 777-200ER. Both are, very unhelpfully, labelled as “Boeing 777-200”. In these cases, you’re going to want to view the seatmap to be sure. A 2-2-2 configuration confirms you have the B777-200 aircraft with the 2009 Regional Business Class seat. A 1-2-1 configuration confirms you have the B777-200ER aircraft with the 2006 Business Class seat. A given route can be operated by a mixture of aircraft, and different aircraft may mean different seats! Assuming all departure times are equally acceptable to you, be sure you pick the aircraft that gives you the best possible seat. If you found this guide useful, be sure to check out the guide for First Class and Suites seats. 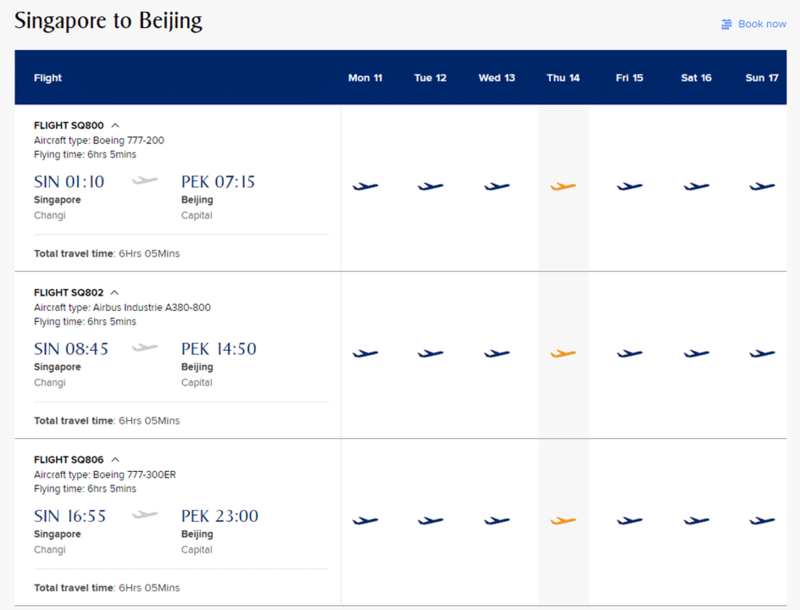 The seat map I see on their website appears different to the screenshots for the A380-800. Any other ideas on how I can check whether I have the 2006 or the 2017 business class model? I am flying SQ from SIN to FRA. updated and fixed, good spot! nice reference! I will spent my Air China miles on Business class and save the SQ miles for the first and suite. Great overview and happy to see those A333 and 772’s retire soon as per some of your earlier posts. I’m on the 2017 version Business Class to Sydney next week. Managed to get 11D which apparently has the bigger foot bench. And Suites on the way back! Thanks michael! The 2017 j is fantastic- I know some people hate the “sleep diagonal” thing but it never bothered me. Better press those seat control buttons with a lot of force though, they’re hard to press! Thanks!!! It’s my 2nd time and will let you know how it was. I flew 11A last time on the new A380 and quite liked it but now I traded the window seat for the apparently slightly bigger seat on 11D. i’ve only ever flown the new a380 once, didn’t even know 11D was bigger than 11A. what i love the most about the new product is that you’re able to pick various angles rather than just full flat.